focuses on English and math powerpoint presentations. 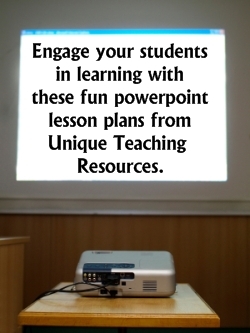 Powerpoint Lesson Plans: Many students find traditional English and math exercises boring and dull. I encourage you to use fun powerpoint activities to bring life to these boring exercises. 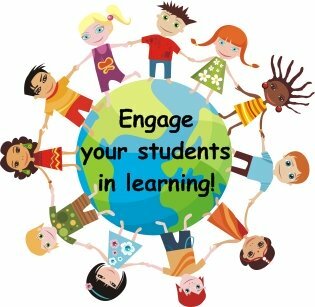 I have designed my powerpoint presentations for teachers to be fun and engaging learning activities. 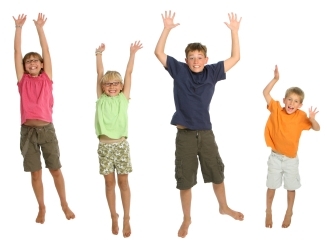 The majority of these powerpoint lessons are presented in a fun game style format. All of my powerpoint lesson plans require students to be actively engaged in the activity by having to follow along by filling in a student response worksheet as students are viewing each slide in the powerpoint presentation. I use large animations (graphics that move) that are all related to one specific theme for each separate powerpoint presentation that I create. These funny powerpoint presentations will capture your students' interest with the large animated graphics that are used throughout the entire slide show. My powerpoint presentations have been designed using two fonts: Arial Black and Comic Sans. I chose these fonts because they are the fonts that are the most widely found on most computers, and they will not change the style and format of the slides when viewed on your classroom computer and projector. In addition, I have designed the majority of my educational powerpoint presentations to contain a fun game style format. My students actually get excited and cheer when they realize that they are about to complete a grammar review lesson using a funny powerpoint presentation game that I have designed. 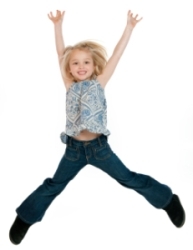 How often do your students cheer when they have to complete a grammar review worksheet? I highly recommend using fun powerpoint presentations in order to engage your students in learning. Once you have observed your students engaged and interested in your powerpoint lesson plans, you will want to continue presenting new lessons to your students using this technology. The last school that I taught at only had one computer projector for the entire school. 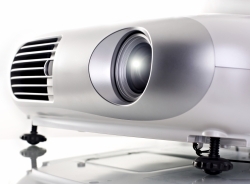 I decided to buy a projector for my classroom to use with my own students. It was the most worthwhile investment that I ever made using my own money for my classroom and students. It literally changed the way that I prepared and delivered my lessons. 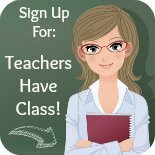 Below you will find a list of the fun powerpoint lesson plans that are available on Unique Teaching Resources. Each of the boxes below contains a short description and a small picture of each of my powerpoint lesson plans. If you click on the underlined link at the bottom of each box, you will be taken to a web page that describes that powerpoint teaching resource in more detail. This new web page will show you larger pictures of the different powerpoint slides that are included in this set of teaching resources. Some of these pages will also contain a You Tube video that you can watch that demonstrates these powerpoint lesson plans. This Back to School powerpoint lesson is designed for the first day of school and helps teachers to introduce school procedures, classroom rules, and their expectations to their students. 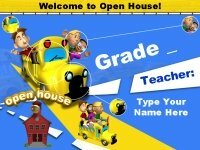 This Open House powerpoint lesson will help you introduce yourself, school day procedures, materials needed for class, school subjects, and homework to parents. 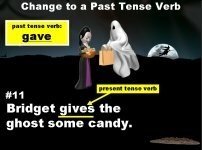 Students find present tense verbs and change them into past tense verbs. You can individualize this activity by replacing the names in the sentences, with the names of your own students. 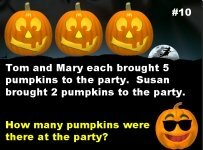 Your students will love solving addition and subtraction word problems with this fun Halloween activity! Each word problem is presented using large and colorful animated (moving) graphics. 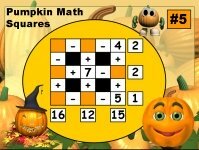 Students have to solve addition and subtraction equations, using an engaging Halloween puzzle style format. There are 5 puzzles in this set and a student answer worksheet. Students have to find an adjective in each Thanksgiving sentence and the noun that it modifies. Then students have to decide if the adjective describes what kind, which one, or how many. 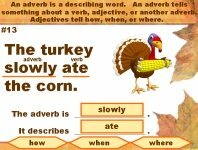 Students have to find the adverb in each Thanksgiving sentence and the verb that it modifies. Then students have to decide if the adverb describes how, when, or where. 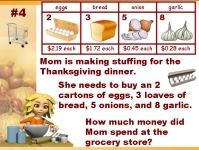 Students use addition and multiplication to solve these Thanksgiving dinner word problems. This activity involves money, so students are reviewing decimal points and place value as well. Students have to solve addition and subtraction equations, using a fun fall puzzle style format. There are 5 puzzles in this set and a leaf worksheet for students to write their answers on. This Christmas Wreath of Fortune Game is named after Wheel of Fortune. Your students will love playing this fun powerpoint game while reviewing homophones! This Christmas Wreath of Fortune Game is named after Wheel of Fortune. 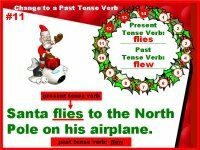 Your students will love playing this fun powerpoint game while reviewing present and past tense verbs. Your students will love playing this Christmas Who Wants To Be A Millionaire game while reviewing these 4 parts of speech: nouns, verbs, adjectives, and adverbs. 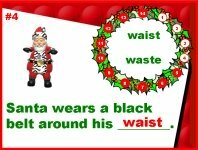 Students use addition and multiplication to solve these Christmas word problems. This activity involves money, so students are reviewing decimal points and place value as well. 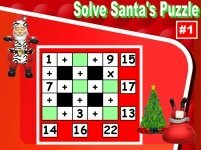 Students have to solve addition, subtraction, and multiplication equations, using a fun Christmas puzzle style format. There are 5 puzzles in this set of resources. Fall In Love With Nouns is a Valentine's Day powerpoint lesson. This fun presentation reviews 3 types of nouns: common nouns, proper nouns, and pronouns. 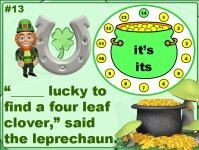 This St. Patrick's Day powerpoint lesson reviews words that often confuse children. The following tricky word pairs are reviewed: its/it's, whose/who's, were/we're, and their/they're. Many of these spring powerpoint presentations can be used anytime of the year. Earth Day is April 22. 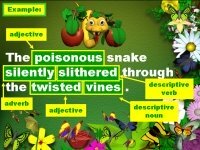 This lesson reviews 4 parts of speech: nouns, verbs, adjectives, and adverbs. 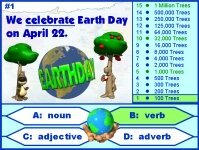 It is similar to the game Who Wants to Be a Millionaire, but it has an Earth Day theme. 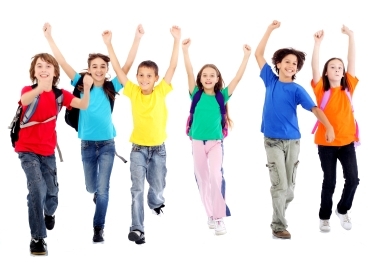 This spring set of teaching resources is designed to be a daily writing warm up activity. There are 25 different sentences for students to rewrite using more descriptive word choices. This lesson reviews the comparative and superlative forms of these 15 words: large, fat, fast, hot, high, late, sad, pretty, loud, many, delicious, bad, good, difficult, and little. 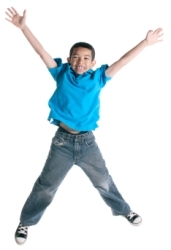 This lesson has a rain theme and reviews 3 end punctuation marks: period, question mark, and exclamation mark. Students write their answers in raindrops inside a cloud on their worksheets. 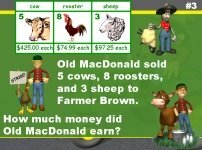 Students use addition and multiplication to solve word problems that have a farm theme. These problems involve money, so students are reviewing decimal points and place value as well. Students solve addition, subtraction, and multiplication equations using these fun math puzzles that contain butterfly themed animations. There are 5 puzzles in this set of resources. 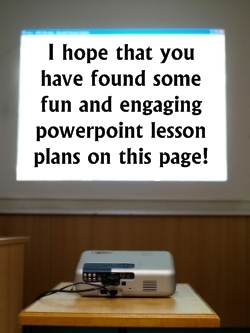 Thank you for visiting my Powerpoint Lesson Plans page.